Who ever turns to public services, whether Health or Social Services, does not necessarily belong to a disadvantaged category. Turning to public services is a right to the benefit of all, but the fact is they are perceived as stigmatized and prejudicial places. Who, really, would like to be considered openly disadvantaged or consider himself as such, after a lifetime of honest work, in this society of beautiful, optimistic and successful of ours? Why be blamed or worse made feel guilty for a failure or difficulties due to contingent factors? Only the Hospital (the one with the capital H) is still considered as a leveling place, where classes (medium, high, low and invisible) are in the same Emergency Room or even the next bed over. On the other hand, Territorial services (Health and Social), like the Ambulatories where one books health care services, are full of seniors and people with low or zero income. People who do not work in the public sector or in a super guaranteed job, use this services very seldom because they cannot afford to lose the time lost to the long lines and waiting lists. Even the Social Services themselves experience the same stigma and prejudice, they are the place where the marginalized par-excellence access. This is wrong, that’s not how it is, let’s not feed this false belief. As I mentioned, in the public Social Services one can find answers that no other places have, besides the listening one can find appropriate responses with the resources available to them: the essential services are guaranteed throughout Italy because of a law of the year 2000, not yet repealed and hopefully never will be, recognized for all citizens. Italy works like “leopard spots”, patchy throughout all services and Social Services are not exempt from this weakness: in some Municipalities works better, in other worse. The weaknesses are organizational, financial, cultural, political and human rights. All are significant, concatenated to each other: without one cannot stand the other. Listening is crucial to the human factor, for an overall view of the transformations, the human and political factors are significant; to the guarantee of the services offered, the financial and organizational factors, the economic hedging of investments and the service organization, join the political and human factor (a good technician is also a good politician and vice versa); the social and environmental context, whether urban or rural binds to various factors, cultural, human, financial, organizational etc.. The Law of the year 2000 (n. 328) establishes as essential, services such as home care, services for early childhood and adolescents, interventions for people with disabilities, also stipulates the principles of a provision for those cases where there is no need of essential services, or at least the one does not exclude the other, because it’s not that one is not either partially or totally self-sufficient, there is no educational or parenting problems but we are in a state of emergency, which we call social emergency, which can endanger the physical life of people. The suicides of the past few days is a prime example. What does Social Emergency mean? It’s a sudden condition caused by a temporarily disabling disease for which one is not covered by the social protection system, or have lost their job and don’t have the coverage from the social protection system. How do the Social Services respond to these emergencies? Not too well, because they have few tools and because the funds allocated to social policies are reduced year after year and investing in the community is not a priority of local administration. The social political assessors have a hard time getting more funds in the budget of local administrations perpetually in red. These are non-shareable political choices, or at least we don’t share anymore, if we ever did. Just one less parking lot and more appropriation for the social policies is what we wish for and this is not populism. When given a choice between cars and people we choose the latter. Since 1992 there is a European Recommendation for the creation in the Member States, of a measure for the income support, the National Law 328/2000 Art. 23 recognizes the Minimum Income of integration as a measure of contrast to poverty which leads back to Social Pensions too. To this day additional communications and recommendations have followed by the Parliament and the Commission, Italy along with Greece and Hungary has yet to achieve a measure of economic support to overcome poverty. 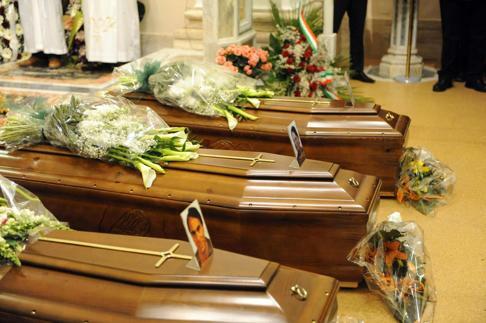 The three suicides of Civitanova Marche, the two others in Milan, and many others in little and big cities in Italy, I’m sure, would still be alive if the laws were implemented and if of Europe we would not speak only as a Stability Pact.